What Can You Expect at All Saint’s Cathedral? Children are welcome and. activity bags for younger children are available at the back of the church We offer Sunday School at our 11 AM service from September to June Children are welcome to receive communion at their parents’ discretion. If you would like for your child to learn more about the sacrament before receiving, please contact the Dean. The liturgy of the Word: four readings from Scripture (Old Testament, Psalms, New Testament and Gospel) and a short sermon, 10-15 minutes. Following the sermon, we recite the ancient Nicene Creed and say a prayer of confession and receive pardon for our sins. The Prayers of the People: we pray for the concerns of each other, our community and the world. After the prayers, we greet each other in God’s name. This is called passing the peace. Just turn to your neighbor and say something like “The peace of God be with you” or simply, “Peace.” After announcements a collection is taken. You are free to contribute or not as you wish. The Liturgy of the Table: Holy Communion is the high point of the Anglican service. It is also called the Eucharist or Great Thanksgiving. You are welcome to come forward to receive communion, which consists of bread and wine. Just hold out your hands for the bread and take a sip from the cup, or if you don’t wish to receive, cross your hands on your chest to receive a blessing from the priest. Or if you prefer, you can remain in your seat during this part of the service. Music is a major ministry at All Saints. Hymns begin and end the service, and Our music director Jeremy Spurgeon and choir offer music at various points throughout. Services end with the dismissal at which we are sent on our way in peace to love and serve God in our lives. 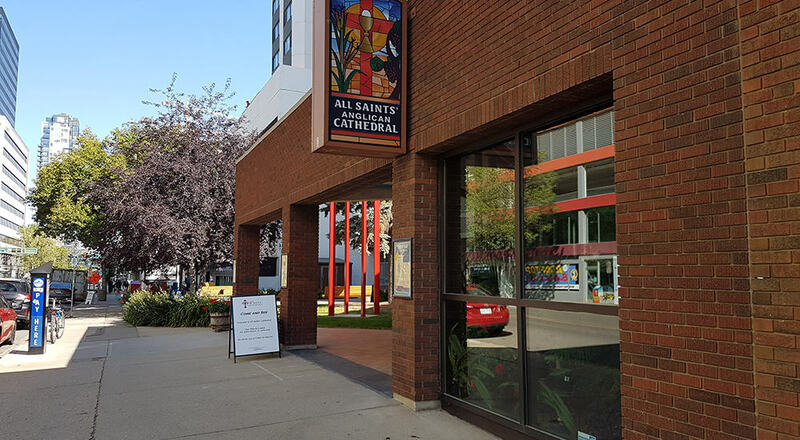 You will discover looking at our website that we are also one of the busiest churches in the city during the week with daily Morning Prayer at 8:30 AM, eucharist at noon every Thursday and Wednesday at 5:30 PM during the fall and winter. We also offer Evensong the first Sunday evening of the month and Taize worship the second Sunday evening. We also have a wide variety of hospitality ministries (Tuesday Lunch, Manna Market Wednesday, Thursday Tax Clinic and lunch and during the winter a Friday breakfast. There is also Centering Prayer on Monday evening. Bible Study Tuesday afternoon at 1 PM and Wednesday evening at 7 PM.